I don’t usually put much stock in marketing slogans, but in this case, I think Ruger nailed it. Their new Gunsite Scout Rifle in .450 Bushmaster is a fantastic all-around firearm, offering the power to take down large game and the maneuverability to carry in the thickest brush. 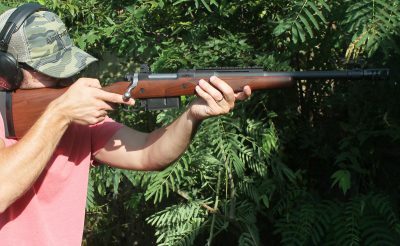 The Ruger Gunsite Scout is a great rifle for many tasks. 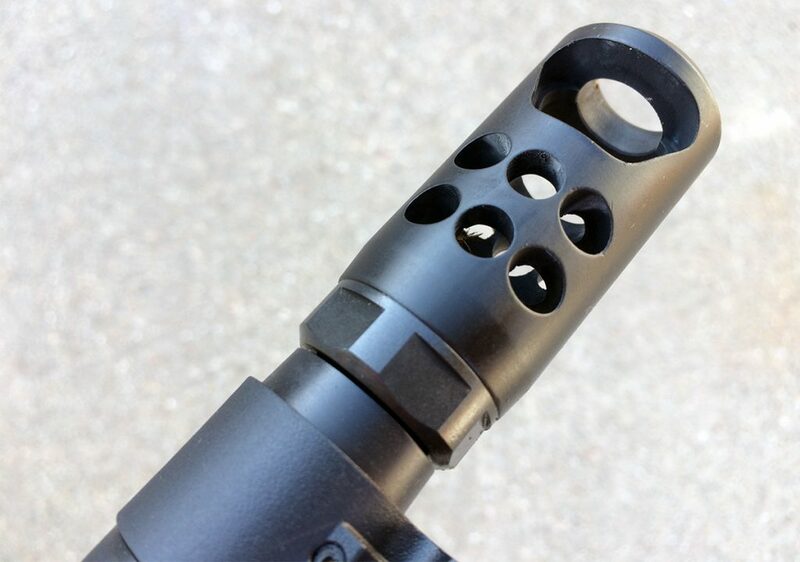 The author found it to handle easily and the muzzle brake helped mitigate muzzle rise. This was the fastest velocity recorded. For comparison, a .45 caliber bullet fired from a handgun is usually traveling under 1,000 fps. The “thumper round” concept was famously pioneered by Gunsite’s founder, Col. Jeff Cooper. Cooper admired the AR-15 platform, but he wanted a round more capable of taking down larger game out to about 250 yards. Tim LeGendre of LeMag Firearms developed his own thumper and called it the .45 Professional. He licensed the concept to Bushmaster Firearms Int’l for production and distribution, and Bushmaster unveiled the .450 Bushmaster in 2007. The .450 Bushmaster has a bullet diameter of .452 inch and uses a cartridge case based on the .284 Win. I used Hornady’s 250-grain FTX bullet with a factory advertised muzzle velocity of 2,200 feet per second (fps). from a 20-inch barrel, which would deliver 2,686 ft.-lbs. of energy. When I measured the bullet velocity out of the Scout’s 16-inch barrel, the round averaged 2,145 fps with a high of 2,168 fps and a low of 2,109 fps. This produced 2,555 ft.-lbs. of energy at the muzzle. For comparison, a 168-grain .308 Win. bullet produces roughly 2,269 ft- lbs. of energy at the muzzle (depending on the powder charge, of course). I can see why they call the .450 a “thumper.” The bullet’s stubby shape keeps it from maintaining its velocity at extended ranges, but anything within 200 yards is going to get hit hard. It’s the perfect round for penetrating a hog’s shoulder and reaching its vitals, and it would also make a great bear cartridge. Hornady and Remington are the only companies manufacturing the .450 Bushmaster right now, and they offer it for ~$1.50/round. If that sounds a little steep, keep in mind that the straight walls of the .450 Bushmaster make it easy to reload, which will allow you to minimize ammunition costs. The front sight is non-reflective and is protected on both sides. Lately, I’ve been reviewing bare-bones, no-frills firearms that stick to the basics without messing around with extra features. The Ruger Gunsite Scout isn’t one of those firearms — and I loved it. Upon opening the box, I found, along with the usual trigger lock and owner’s manual, a barrel thread protector, scope rings, and two spacers to adjust the length of pull. The spacers can be placed between the rubber recoil pad and the stock to accommodate shooters with longer or shorter arms. The iron sights are the Scout’s most distinctive feature. The rear peep sight is adjustable for both windage and elevation, and the front blade is protected on both sides. The sight picture is easy to acquire, and adjustments can be made with the provided Allen wrench. The iron sights are a great resource if you’re deep in the brush and your scope malfunctions or loses zero. 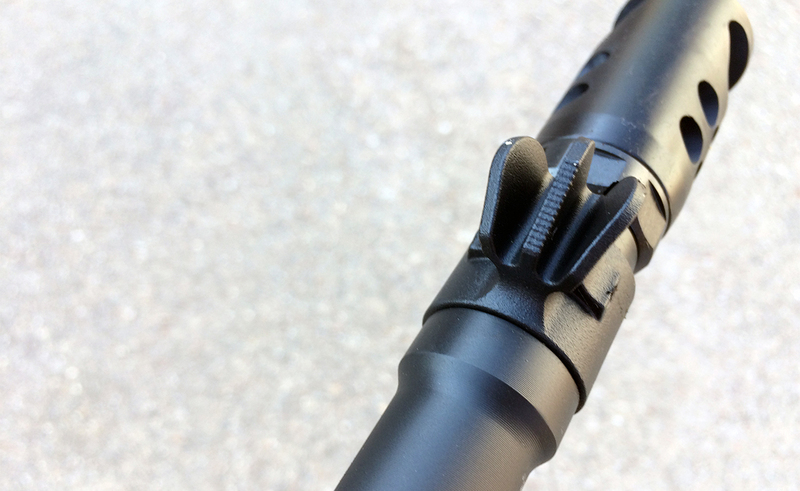 Ruger’s Precision Rifle® Hybrid Muzzle Brake does a nice job controlling recoil. It uses a somewhat unorthodox 11/16 inch to 24-inch thread pattern. The rear sight can be easily adjusted for both windage and elevation and can be mounted in front of the magazine well or behind it. The safety includes three positions. 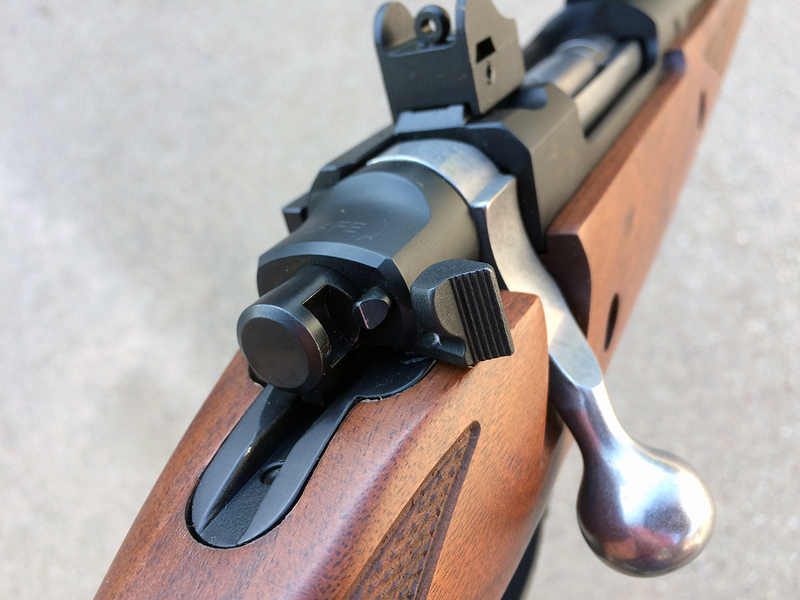 In the rearward position, the bolt cannot be opened and the trigger cannot be pulled. In the middle position, the bolt can be cycled but the trigger cannot be pulled. This allows a live cartridge to be extracted from the chamber without fear of accidental discharge. In the forward position, the gun is ready to fire. When the gun is fired, the beefy muzzle device helps control recoil. But be warned: the Scout is LOUD. I opted for double ear protection after a few shots. If you plan to take the Scout hunting, you may want to purchase a pair of electronic ear muffs so you can hear environmental sounds without damaging your hearing when you pull the trigger. The muzzle device can be removed, which helps lower the blast volume but also increases muzzle rise. While the rubber recoil pad absorbs a surprising amount of felt recoil, the gun still jumps quite a bit when fired. Shooters can experiment with the muzzle device and the recoil pad spacers to achieve optimal levels of recoil, muzzle jump, and noise. The Scout includes quite a few additional features (factory mounted Picatinny rail; detachable box magazine; free-floated, cold hammer-forged barrel), but I’ll wrap up this section with the most important interface between the shooter and the gun: the trigger. The trigger’s break is clean, crisp, and, most importantly, consistent. It broke at 3 pounds, 8 ounces. Here the safety is in the middle position, which allows the bolt to be opened but keeps the trigger from dropping the firing pin. After familiarizing myself with the rifle’s features and function, I was curious to determine its accuracy. Considering the round’s effective range, I knew that 1.5-inch groups at 100 yards would be sufficient. The rubberized recoil pad absorbs tons of kick. Despite the force of the .450, the author found the Scout to be pleasant to shoot. I began by zeroing the rifle at 100 yards using a 2-7X Bushnell Trophy Scout scope. Scout scopes feature longer eye relief (distance between the shooter’s eye and the front lens) than standard scopes, which allows them to be mounted forward of the receiver. The Bushnell scope I used had an 8-inch eye relief, and I was able to acquire a clear sight picture quickly. I tested the rifle’s accuracy by shooting 20 three-shot groups, the best group measured .81 inch and the average was 1.7 inches. 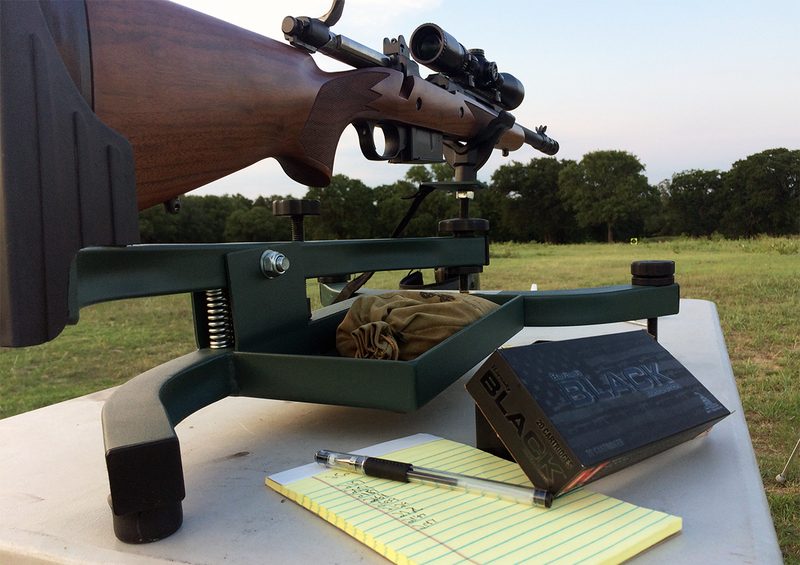 The rifle’s accuracy testing results deserve a few notes of analysis. First, I was pleasantly surprised to have been able to record two sub-MOA groups and one 1-inch group. While I wouldn’t call it a sub-MOA rifle in a general sense, it is possible to shoot less than 1-inch groups if you do your part as the shooter. I also discovered over the course of my testing that the Scout’s barrel heats up quickly. After nine or ten rounds, the group sizes started to expand, at which point I’d let the barrel cool. The four largest groups were shot when the barrel was the hottest, immediately before each cool-off period. Considering the heat of the barrel, a fairer assessment of the rifle’s accuracy might be reached by excluding the last four groups, in which case the average drops to 1.47 inches. 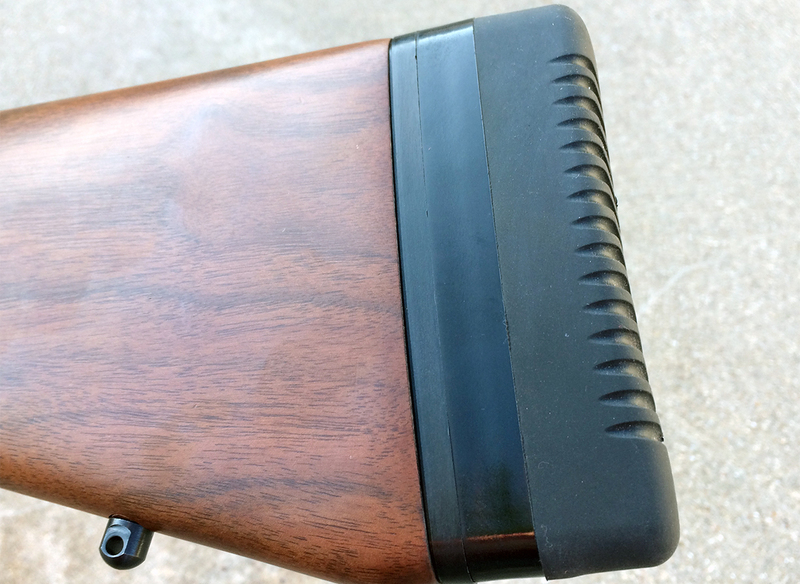 A Caldwell Lead Sled helped the author steady the rifle and shoot consistent, reliable groups. 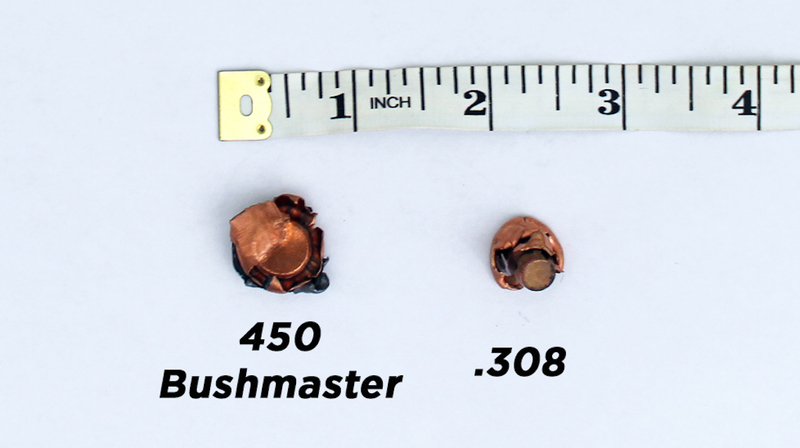 Still, I wanted to communicate some sense of the power of the .450 Bushmaster, so I set up two comparative tests. First, to get a handle on the round’s ability to penetrate wild game, I lined up 12 one-gallon water jugs. I shot the line of jugs with a 62-grain 5.56 Nosler Ballistic Tip, a 165-grain .308 Nosler Ballistic Tip, and the 250-grain .450 Bushmaster Hornady FTX. The .5.56 decimated the first jug and split the second, but lacked the mass to continue through the third. The .308 blasted its way through four jugs and punctured the fifth. I found the round still more or less intact when I emptied the fifth jug. The .450 Bushmaster made its way through three jugs, and I found the round lodged between the third and the fourth. I was surprised that the .450 rivaled the .308 in terms of penetration. I thought the .450’s stubby shape would hinder its ability to get through more than a few jugs, but its mass and velocity made up for its squatty physique. 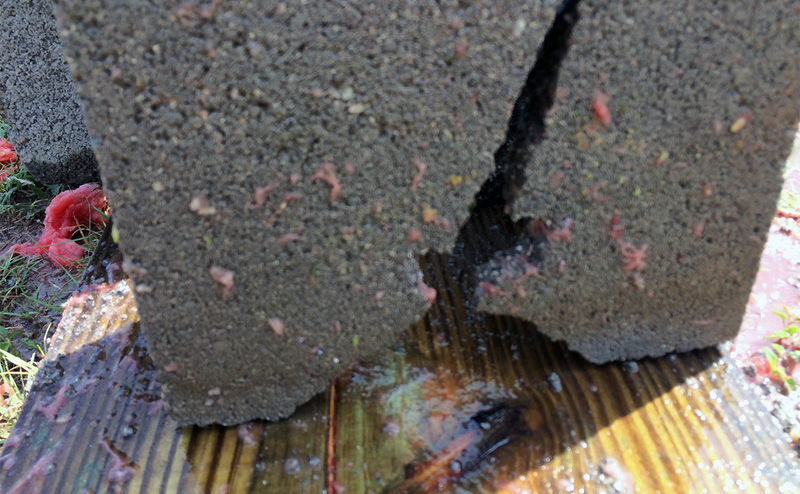 The .308 is made for punching holes in things, which it did to this cinder block. Also, note how the .450 expanded as compared to the .308. The .450 is at least two times the diameter of the .30 caliber round, which would have inflicted massive damage traveling through a game animal. The .450 might lack the extended range of more traditional rifle cartridges, but it will devastate anything it touches within 200 yards. To confirm this theory, I set up a second (very unscientific) test. I placed a watermelon in front of two or three cinder blocks and shot through the watermelon with the .308 and the .450. 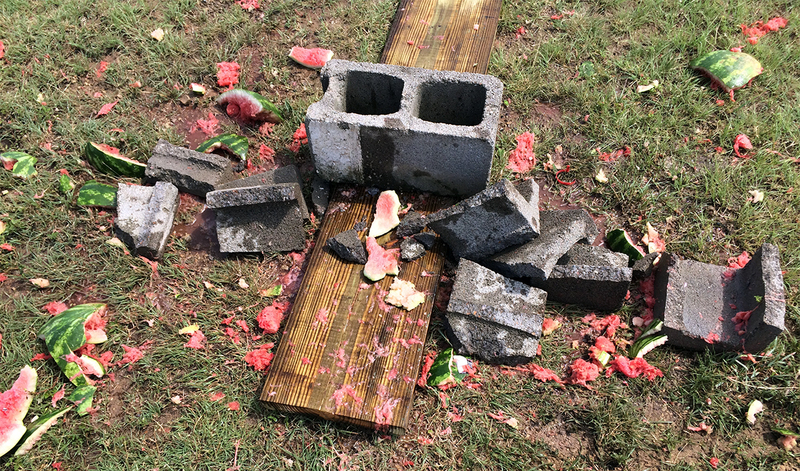 As you can see, the .450 smashed through the watermelon and the cinder block with quite a bit more force than the .308. I already knew this based on my ft.-lbs. of force calculations, but it’s cool to see those extra 300 ft.-lbs. of force in action. Whereas the .308 penetrated the cinder block and split it in two, the .450 smashed it to bits. The .450 Bushmaster, on the other hand, totally obliterated the watermelon and the cinder block behind it. The .450 Bushmaster is a remarkably effective cartridge at short-to-medium distances, and the Ruger Gunsite Scout does a nice job taking advantage of its unique capabilities. The Scout comes with everything you’ll need to take big game in the brush, and its accuracy and durability will ensure a good shot when the moment is right. I was impressed with the Scout throughout the course of my testing. It’s pleasant to shoot (considering the round), light weight, and it handles well in the field. I’ll be recommending it to my hog-hunting friends here in Texas, and you might consider it, too. For more information about the Ruger Gunsite Scout Rifle, click here. For more information about Hornady ammunition, click here. To purchase a Ruger Gunsite Scout Rifle on GunsAmerica, click here. .450 is an awesome round for a rifle. But if you want a perfect shot you might need a perfect scope. Athlon Cronus BTR is a great quality scope for .450 bushmaster rifle which 4.5-29 x 56 magnification. It might can make a perfect shot while you are in a hunting. That is not the best scope for the 450 BM. I have athlons and while nice they are way too heavy and the extra reticle markings are not needed for deer hunting at 30-200 yard range. The best scope for the money is the Leopold 3-9x with CDS 450 turret. Its only 12oz compared to the Athlon which weighs 3x more. Its super bright, fits the included rear rings of the Scout too. To use the Athlon you have to buy new rings adds like 1K to cost of gun and will actually be worse than the $3.00 Leopold for deer hunting. I agree the 45/70 is nice but its illegal in the states for deer hunting. The 450 is the biggest legal round that can be used say in Michigan’s shotgun zone. The 44mag is like 1/2 the hitting power of the 450. So in states where its straight wall of a certain length the 450 is the best. Its more powerful than at 45/70 for stock ammo. Re-loaders can make up for it but for most people that do not reload the 450 is better than the 45/70, hits a bit harder. The 450 Bushmaster Looks like a good option and it would be great to see it offered with a 20 -22 inch barrel length. The additional length would assist the 450 Bushmaster in obtaining top velocity, and tame recoil / barrel rise and still remains compact. A LH version would be great too. Yea I thought the same thinking a 22″ barrel would be better but after using both I settled on the 16″ scout. The velocity difference is not much and its much much easier to shoulder than the long barrel. hi everyone…..nice rifle and all the rhetoric that ppl love hearing……any thing i possibly say would be positive…..but……its somewhat too much money…..obama, clinton and the so called bolshevic/democrat party can take credit for that…..knock about 25% off of the $$$$ and it would be good for everyone……(Ruger and the Consumer)…..and the cost of ammo is nothing but robbery……and the Bull-Poop about re-loadable does not justify or stack up…..
Two additional non-starters for me. Bolt action and detachable magazine. Please chamber it in 50 Beowulf, I have the caliber in an AR and it is a fun shooter. At the range most feral hogs are shot, a Ruger Super Blackhawk .44 mag. will stop them in their tracks. Easy to carry, cheaper ammo and rock-solid reliability, it is a “one-gun” solution for hogs at half the price. If you must use a long gun, 12-bore slugs will fell all creatures great or small within a hundred yards. Rifles chambered for cartridges that fire a bullet of .357-inch diameter or larger, have a minimum case length of 1.16 inches, and have a maximum case length of 1.8 inches are legal to use only during the deer firearms, youth, reduction zones from Nov. 18-Jan. 31 (in zones where local ordinances allow the use of a firearm), and special antlerless seasons. Action Express, .500 S&W, .460 Smith & Wesson, .450 Bushmaster, and .50 Beowulf. Full metal jacketed bullets are illegal. I am just guessing that Ruger came out with these rifles to fill a void in guns available for states like mine. I canot even guess what goes through the mindes of the people in charge of these states but to answer some of you i would be just fine hunting with a 45-70 but the cartrige is to long. Nice looking gun, but why anyone would choose this over a 45-70 has me scratching my arse … sorry, head. Granted it’s a bolt gun but the venerable 45-70 is available in many different platforms with a plethora of factory ammo available from mild to wild. And if you’re a hand-loader you can approach .458 Win Mag velocities and stopping power with the correct rifle using a very large selection of projectiles. MUCH more than is available for the .450 and about half the cost! Need to load up some 500 Gr. solids to thump an elephant, or 300 Gr. HP for whitetails? No problem, the 45-70 will do it. AND – if you’re up in Alaska hunting and you only want to carry one type of ammo for your main gun and back up gun you can use the same 45-70 ammo in a pistol like the BFR or Thompson Contender if you like. But I will say I’ve tried J.D. Jones’ original 45-70 loadings with 500 Gr. solids loaded for my SSK 12″ Contender and it’s NOT for the faint of heart! Sorry Joe, I do believe your mistaken on rugers not having a warranty. I do believe all there guns have one. I have a ruger #1 in 45/70. A beautiful gun. Well, I won’t go into details, but I destroyed my forearm. Totally my doing (fault). I called ruger and they gave me the address to send it to. I had no idea what it would cost, and didn’t care. I wanted my baby back. To my surprise, I got a call saying they got it replaced. were going to test fire and safety check it and send it back. NO CHARGE, I could not believe they fixed a gun that I broke and fixed it for free. That is customer service that can’t be beat. They don’t need to put there warranty in print. They stand behind there products. Made me a ruger fan. Joe, while Ruger doesn’t have an expressed warranty, they will fix or replace any of their firearms for free as long as there are no obvious signs of abuse. Well Joe I guest you don’t have any aperantly youhave no experience the Ruger firearms. I have had a few over the years and I only had trouble eith two. One was a 10 year old SP101 that I screw up the barrel. I called about a new barrel. I was ask to ship it in and they sent me a prepaid shipping label, so off it went. In about 10 days I received a call asking me to supply them with my FFL’s infor becsuse they were sending me a new gun. The other was a 10/22 with ejection problem once again they took care of it at no charge plus they sent me exta magazine for my trouble. So don’t speak to issues you have not researched. Can you be a little more dramatic? You would not take a $1,000 gun if they gave it to you free? I doubt that. And they do have a warranty. I had a bent magazine and they sent me a new one free no question asked other than my serial number. Very easy to work with. Please don’t spread fake news around the web. I hunt an AR with .450 Bushy upper, Collapsible Stock, and 4 rail free float hand guard, Jewell trigger. It is great for walking through the woods or climbing into a blind, truck. Carry on a single point sling like an M4. Not a long range option, for that there are more suitable options but for applications listed above… The .450 Bushmaster is an excellent cartridge and deer, hogs and coyotes cannot tell that the .450 Bushmaster doesn’t have .458 bullet BC or construction. .450 BM kills animals like a Hammer and isn’t that what you want .? The Ruger is an interesting firearm ? Sorry to say, don’t think it does anything a Marlin Guide Gun already does. The Marlin is a lot less $. I cannot fathom why they chose .452 rather than .458 for bullet diameter. Maybe they didn’t want to be accused of duplicating the SOCOM (did it come first?). Choosing a pistol caliber limits you on the upper end of bullet weight. Also, many of the expanding pistol projectiles will give very little penetration when pushed harder than intended through a rifle barrel. Sure, hard cast bullets or solids will work, but you are still shooting pistol bullets with a lesser BC than rifle shaped bullets. Somebody help me out, cause I just don’t get it. I recall hearing something about the .450 Bushmaster being loaded with muzzleloader projectiles rather than a more standard offering for a cartridge arm. Maybe that is where the difference comes in? Do .45 caliber muzzleloaders shoot a .452″? It does seem obvious that a .458″ would offer a greater variety of heavier bullets but would a cartridge with a case as small as a .450 Bushmaster, in the .223 class, flourish with a 300+ grain projectile? I could not say for certainty without some experimentation but I would expect not. Tim designed the round to use the .452 bullets due to a much larger selection of projectiles. This thought process also includes the fact that .458 bullets can be resized to .452 and used as well. Best of both worlds. Whenever there’s a sales slump in the shooting industry, various companies parade out their latest series of firearms & cartridges, hoping to stir up interest. In recent memory, we see the WSM & the WSSM series of cartridges. Remington brought out the RUM series. Of the entire WSM & RUM series, perhaps one or two each of those two series of cartridges might survive. Occasionally, you’ll have a real barn burner like the .40 S&W. If you happen to have a firearm chambered in one of the discontinued chamberings, then too bad/so sad; you my friend are SOL. After reading the article I only have one word: why? Once again this website completes the task of being kust another sales tool. OMG Yet Another almost useless obscure cartridge trying to JUSTIFY IT’S EXISTENCE!! I do not own this rifle. I have not fired nor studied it. But I am very familiar with the rear sight since it was borrowed from the Mini-14/30 and is a piece of crap. 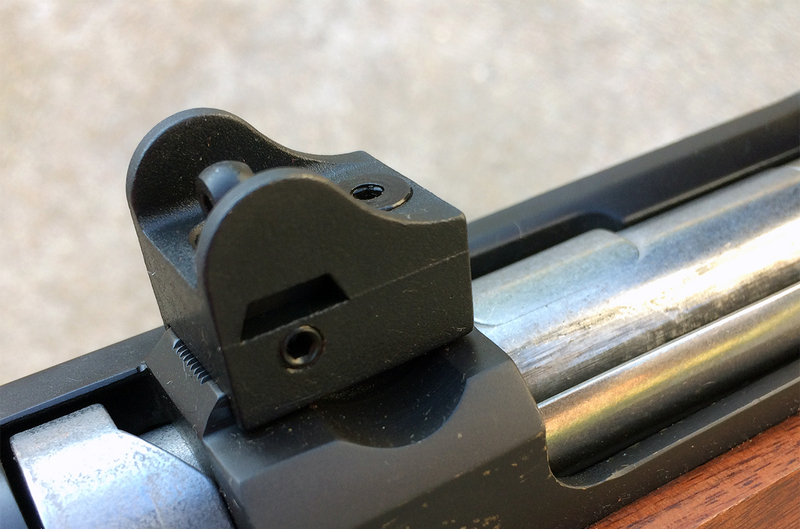 If my two Mini-14s are used as examples, the rear peep hole sight is unstable. 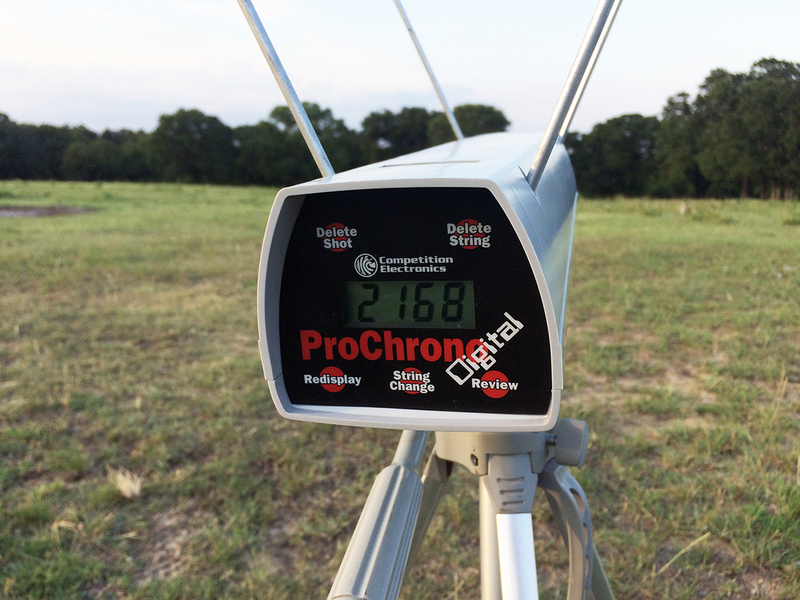 It moves constantly due to the high recoil forces and has very little measurable adjustment. “Blue” Locktite helps keep it still but doesn’t help with accuracy. The rear sight body itself gets jarred out of place with continuous recoil. Again Locktite helps. The answer is forget the iron sights and get a red dot for the “Scout” rail or a quick action AR scope. But my chief question is a 450 round for what? What’s wrong with standard game ammo? Non-standard cartridge and hearing protection needed are non-starters for me in only one rifle. And these non-starters are only two of many. I have the Ruger American SS 22″ barrel model. It is hands down the most accurate out of the box rifle I own and or have ever shot. Have no regrets what so ever with the gun. A breeze to reload for. have had no issues finding loaded ammo or brass. To me it is a modern 45-70 and yes I own a LOT of 45-70 guns. And no I will not get rid of them. I own several .444 Marlins which will do anything that this 450 Bushmaster can accomplish… In fact it will most likely do it even better and has been around since 1965. Also have a pair of 45/70’s Lever Guns that cost me @ $300 each and are in the same power class but will concentrate on only the .444 Marlin because I feel it’s actually the superior cartridge. #1. A 444 with 22″ bbl shooting a 240 gr .429 slug at 2300+ fps with @ 2900fps of energy… Ammo easy to find and paid only $325 at gun show for a used 99%+ gun still in original box. Will also push a 265 grain slug at @ 2200 fps and a 300 grain at @ 2,000 fps. both with enough energy to drop anything on the North American Continent. #2. Also own a scarce Marlin .444P built in 1999 with 18.5″ ported bbl… 1/20 Ballard Twist weighing in at 6.5 lbs and 37″ long that can still push that 240 grainer at @ 2200 fps with more than adequate punch to drop anything within that 200 yard barrier. Cost on that jewel after a bit of negotiating was a mere $375 in Feb of 2017 at a local gun show and was also is in original box and believe it was still UN-fired. Those lever guns are also much faster on 2nd and consecutive shots than any bolt action… especially in a Brush Hunting Situation. So why pay $1,200 for a .450 Bushmaster Ruger that’s almost impossible to get ammo for unless you stock up online at ridiculous prices. Not convinced that it’s a very good deal until ammo prices drop and become more available.. plus the gun also becomes more available and can be purchased at @ half or less of that suggested retail price. It’s not any uglier than a SMLE, and what I was reminded of at first glance. The .44 Mag Ruger Semi Auto, Model 3 in .45-70, certain 788 Remingtons, .350 Mags, Model 7’s were presented much the same way. Stubby brush guns, varying degrees of power, saleable profiles. Which isn’t so ugly at all, undeniable attraction to function over form, which should be applied more often. Limited availability of rounds preclude choice for all-in-one right now, but the point is valid. Lots of cartridges apply to all-in-one theorizing; though just another way to market one more into your personal arsenal. It is the firearm + cartridge which really dictate all-in-one. One more interesting detail is authors productive dexterity in wildcatting new rounds; viz .556, .5.56, 450 Bushmaster. The one rifle concept limited to around 2-3 meter range is just stupid. Especially in a Bolt gun! The .450 is an excellent short range hunting cartridge, but hardly a “one rifle” caliber due it’s lack of range. If survival were strictly as a game getter in heavy forest or brush, than perhaps, but it lacks credibility on so many points. It would be severely limited in open prairie or savannah. The comparison to the .308 pales when ranges to 500 meters and non game usage come into play. Factory ammo? What an interesting idea. Bought one of these (yep, sure are ugly rifles), got a bunch of brass and a set of dies and got out my Ranier plated lead .45 Colt projectiles…what a pleasant and uncomplicated cartridge to load. Was I absolutely amazed by the sub MOA group on my rest. The rifle is a tack driver…with my cheap cast/plated bullets…the author didn’t lie, it’s an accurate rifle/load to shoot….not a pretty rifle though. The 450 BM was developed for the AR, and is useful in that platform, but suggesting that that cartridge in an all purpose, one rifle only as a great choice is a poor recommendation. The 45-70 is a much better choice with better ballistics in the non-trapdoor loadings and has better availability. Plus using the trapdoor loadings offers a low recoil option for practice or other uses. Leave the 450 BM for the AR, but if you only have one gun and it is an AR then this would be a welcome caliber option for bigger stuff. WHY? This has still not been answered. Not for me. If you like to shoot more than a few shells you will have to take out a second loan on the homestead to buy ammo. One rifle , make it one that you can afford to shoot and ammo is easy to find. .22 rim fire,.223 the older calibers that can be found at your local sporting goods store,even if you live in a small town. Nice Article. My buddy and I have Gunsite Scouts that started as 308’s and were rebarreled by SBR to 458 SOCOM, a few years ago. Supersonic it’s formidable with 325 gr Tripleshocks. Subsonic and suppressed its INCREDIBLE with 500 gr JSP’s. Bushmaster and Beowulf are cool but lack bullet options the 458 SOCOM has available. The 450BM can use any 0.451-0.452 bullet that is designed for the velocity you’re loading it to…AR platform rifles pretty much require a jacketed design, though. You can get bullets from the factory loadings that are polymer-tipped, solid copper hollow point, solid brass and regular JHP designs. Ditto plus some for handloading components. Brass is available from Hornady and Starline. How might the .450 work for Deer hunting or would it be too much gun? The .308 based 45 Raptor has 30% more energy than the shorter Bushmaster. Why not take full advantage of the Ruger Scout receiver? I got the .450 Bushmaster upper for my mil spec AR-15 lower and love it! 2 guns in 1. The 450 Bushmaster isn’t twice the diameter of the .308, but perhaps the author meant twice the frontal area? It’s a little more than twice the cross sectional area, not diameter as you point out. I believe the author was referring to the expanded bullet size, which in the picture looks to be almost, but not quite, twice the diameter of the .308. The .308 is a ways from the tape, but it looks to be just about 1/2″, whereas the bushmaster is over 3/4″ expanded. Still hyperbole, though. Another advantage to a bolt action 450 BM is you can load it much hotter than for an AR. The AR is limited to 40k psi due to the ammount of material that had to be removed from the bolt head to accommodate the 450 BM round. A bolt action that shares the same bolt head as any 308, 30-06, ect has no such limitation and can be loaded back up to 284 win specs which is over 60k psi. Its good for an additional 300-400 fps over factory loads. The cases are immensly strong and last nearly forever, even when using nuclear level loads. I’m able to push 250’s at 2600 fps without issue and 300’s to about 2300 fps. It is able to use a very wide rsnge of powders from fast pistol powders for subs to some of the faster rifle powders. It’ll shoot any .452 dia projectile and you can also resize .458 rifle projectiles and use those as well. Its a very versitile round and proven to be very accurate in my experience. If I could only have one rifle, it would be one that fired common, easy to find ammunition. IMHO almost any combo gun, like a .223/12ga. Why that particular pairing? Well, .223 is almost as popular as .22 and 12ga is arguably the most popular shotgun ammo (in addition to both being military rounds). So, if SHTF ever occurred, both rounds should be relatively easy to obtain by scrounging. 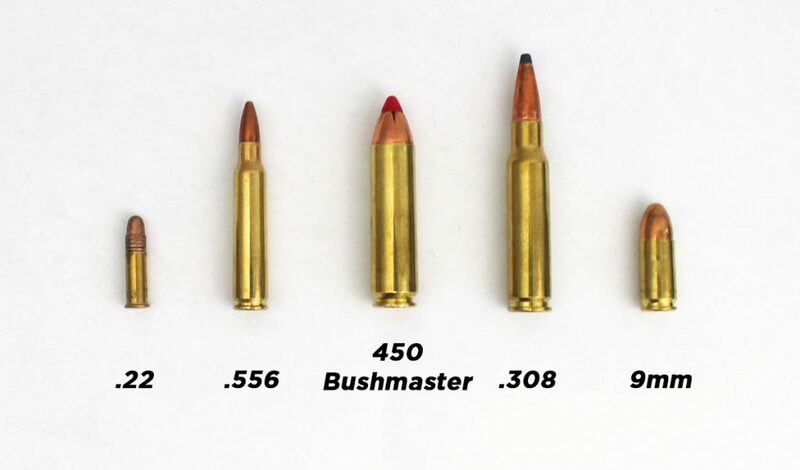 Why limit yourself to one caliber, especially one that is not common, like the Bushmaster .450? Just thinking back to less than a year ago, when there was a national disaster (8 years long…) 223/555 was scarce as hens teeth. 450 Bushmaster was available at the LGS, Walmart, and DSG. Given the popularity of the 223, it’s gonna be the first round to disappear in any sort of emergency or panic. I’ve rethought my SHTF/EOTWAWKI scenarios since then. Just because the military uses it doesn’t mean I’ll be able to get it. It will be hoarded and used by people with guns and armies to back them. Better off getting what you need/want now in whatever caliber you prefer. Better still, have a variety of calibers to take advantage of whatever you can find. Better still, reload and stockpile components. Better still, establish yourself early on after societal collapse as a local warlord/hegemon so you can command the armies to do your bidding and not worry about the whole caliber problem. Wouldn’t try to sell anyone what on the 45-70, 458 SOCOM, or 450 BM, but it’s not a terrible idea. Agreed that it’s not gonna be a great “do it all” round (I wouldn’t want to eat the squirrel shot by any of those rounds), but I could see it serving a useful place in an arsenal of freedom. I agree that the .450 is a great round! BUT If you can have only one gun, why would you pick one that is almost impossible to find Ammo for?????? A .22 rifle is the best if you can only have one. Ammo is always available and cheap! You may not be able to take big game easily, but you can both protect yourself and take small game easily! Hands off my 22 I agree with having only one, give me a 22 it will take small to mid range game. They are very deadly with the right bullet placement.